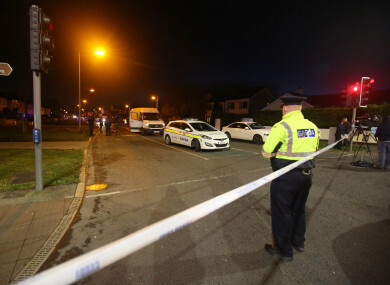 Lee Boylan, who is in his mid 20s, was shot a number of times as he sat in a van in traffic at the junction of Blakestown road and Huntstown Way in Mulhuddart. He was treated at the scene by emergency services personnel and removed by ambulance to Connolly Hospital. He has since been transferred to Beaumont Hospital where his condition is understood to be critical. The injured man was the driver of a white VW van registration number 151D43908 and stopped in traffic at the junction when he was approached and shot a number of times in the upper body by a gunman. It’s understood the gunman had gotten out of the passenger seat of a black or grey BMW. This car was then driven to nearby Saddlers Lawn where it was set alight, while the gunman fled on foot to Huntstown Lawn. The investigation is being led from the incident room in Blanchardstown Station, enquiries are ongoing and no arrests have been made to date. Speaking this afternoon from the scene of the incident Superintendent Liam Carolan gave descriptions of two men who were involved in the incident. The gunman is described as approximately 6ft tall. He was wearing what is described as a dark bulky parka style jacket, a black baseball cap with a white logo and a blue glove on his left hand. He left the scene in the direction of Huntstown Lawn. We also wish to speak with the driver of a black VW Golf seen leaving this estate shortly after the incident. Email “Gardaí appeal for witnesses after Lee Boylan shot a number of times in Mulhuddart”. Feedback on “Gardaí appeal for witnesses after Lee Boylan shot a number of times in Mulhuddart”.